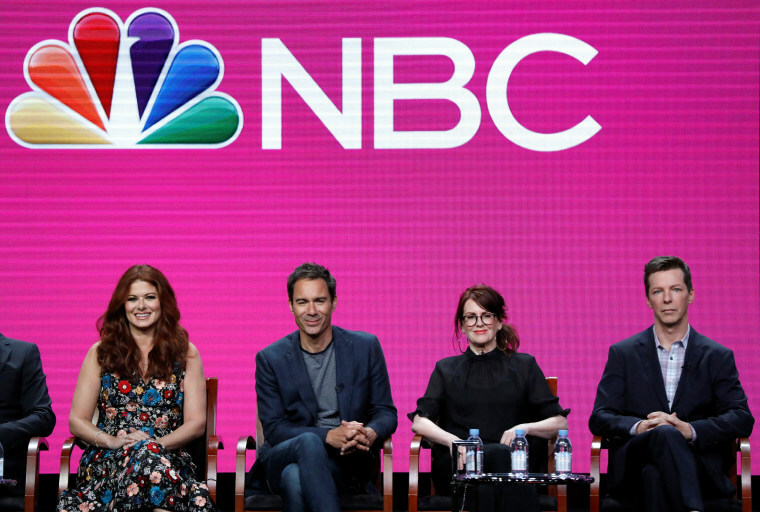 BEVERLY HILLS, Calif. — The revival of "Will & Grace" has yet to air, but NBC says it's getting at least a second season. NBC Entertainment Chairman Robert Greenblatt told a TV critics' meeting Thursday that the deal had just been worked out. The original, Emmy-winning series aired from 1998 to 2006. It was regarded as revolutionary because of the way it helped promote acceptance and gay rights. This iteration will also use comedy to reflect the times. "I think that still, first and foremost, (it) is the job to be funny," said McCormack. "Will that include political and cultural things? Of course it will. First and foremost, it's a funny show." Hayes, however, wanted to rein in expectations that the objective will be to tackle the Trump era. "Our show is not a news show. Our show is a situation comedy," he said. Despite that, it was politics that brought them together and sparked the idea of a reboot. Last September, the cast took part in a nearly 10-minute video that was released before the first presidential debate between Hillary Clinton and Donald Trump. Its message: Vote for Clinton. Mullally said just reading the script for that short made her want more. "I emailed (co-creator) Max (Mutchnick), and I said, 'Why can't we do the show again?' And he emailed right back, 'We can.'" "Will & Grace" ended with a flash-forward 20 years into the future with Will and Grace no longer BFFs but reunited because of their children. Producers now say the reboot will ignore the events of that final episode. The cast had their first table read Wednesday and Messing said it was something she needed. "It felt like coming home and we laughed so hard and for the last year, I'll speak for myself, it's been a confusing time. I haven't laughed very much. To come back together and to laugh out-loud and to be surprised by one another and to have new stories to tell and have the opportunity to do it, it's a no brainer. It's just a beautiful, crazy thing that's happened." The "Will & Grace" reboot debuts Sept. 28.